I had gotten some new potatoes and zucchini in my CSA box this week. I also had on hand the garlic I picked my self (thankyouverymuch) at HighCross Farm on Tuesday. I decided to throw a litte sautee together and see how it came out. First, I sliced up my potatoes. 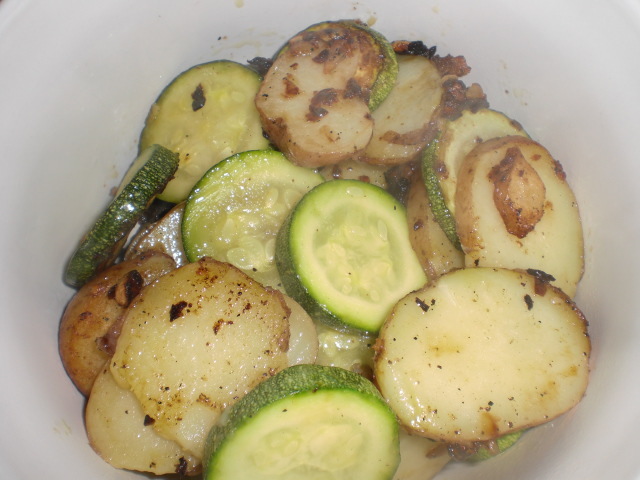 I wanted to sautee the potatoes and the zucchini together and didn’t want raw potatoes with soggy, overcooked zucchini. I decided to steam my sliced potatoes first. Put your potatoes in a steamer (or a make-shift steamer of a sauce pan, colander and lid). I steamed the potatoes until soft enough not to be crisp yet with enough bite (new potatoes can sog up on you if overcooked as well). Put your olive oil in the pan…medium high heat…add shallot and let fry until crispy. Add garlic and let sautee until clear but not brown (brown garlic is bitter garlic). add zucchini and potatoes, S&P, sautee zucchini starts to get opaque in the center. The picture doesn’t do this dish justice. It was fantastic. I liked the crunchy shallot against the softer potatoes and zucchini. I will definitely make this again.